Sorry to hear about the suicide of a student at Central University Hyderabad. What is shameful is that all political parties using it for their political gains. These folks are just like vultures waiting for dead bodies. The media is also playing it well for their respective political masters. Sometime back a student committed suicide at IIT Madras. All of us demanded for proper psychological counseling. It is strange that no one is even talking about appointing few psychiatrists at schools, colleges and universities. This is utterly shameful. 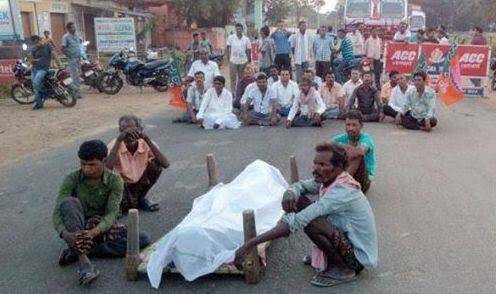 Another point, many farmers are committed suicide in western Odisha. Why no politicians visiting them? Why no award-wapsi for them? Activists, politicians and media folks-all are hypocrites. Hamam mein sab nange hain!!! BALANGIR/BHAWANIPATNA:An inter-ministerial team from the Centre visited the drought-affected areas of Kalahandi and Balangir on Friday. The team members, divided into two groups, visited several villages in both the Western Odisha districts and held discussions with affected farmers. In Balangir, the five-member team led by Commissioner of Department of Animal Husbandry and Dairy, SK Dutta arrived in Sibtula village and then proceeded towards Bhutiarbahal, Singhamunda, Bandupalla. The members spoke to farmers about the extent of crop loss, availability of irrigation and prevailing drought situation in the villages. They also convened a meeting with members of Panchayati Raj Institutions (PRIs) at Bandhapada gram panchayat office on various farmers’ issues. Later on, they visited Brahmanijoar village under Deogaon block and went round a minor irrigation project in the village, which has been lying defunct for the last 15 years. In Kalahandi, the four-member Central team, led by KS Srinivasan, Joint Secretary in the Department of Agriculture and Cooperation, interacted with farmers and villagers to take stock of the crop damage. Srinivasan, the team leader, expressed concern over widespread damage to crops, including paddy, due to the drought. They visited Karlapada, Haldi and Kendububka in Bhawanipatna block; Utkela, Patikudi and Nasigaon in Kesinga block; Gunjermal, Ulikupa, Saria, Nisanpur in Narla block of Kalahandi district and interacted with farmers. On Thursday evening, the team members held meetings with the Collector and district-level officials. The officials had informed them about the need of Rs 18.45 crore for distribution of agriculture input subsidy to 35,247 farmers. The district administration sought financial assistance of Rs 145.5 crore to tide over the drought situation. The drought, triggered by failure of monsoon, has affected 1,642 villages spread over 234 gram panchayats out of a total 2,248 villages in Kalahandi district, according an assessment by the Agriculture Department. The Department assessment had revealed that 49,304 ha of paddy land and 21,743 ha of non-paddy land had been adversely affected due to erratic monsoon and moisture stress condition. Srinivasan said crops in both the districts have been badly affected due to deficit rainfall and they would submit a report to the Central Government in this regard. Sambalpur: Farmers under the aegis of Paschim Odisha Krushak Sangathan Samanwaya Samiti (POKSSS) will begin a three-phase agitation across Western Odisha districts on December 18 over their demands. They will conduct public hearing by roping in family members of farmers who committed suicide. The first such hearing will be held in Bargarh district on December 20, said POKSSS leader Lingaraj. The agitation will conclude with a farmers’ convention in February next year. Bhubaneswar, Dec 1 (PTI) A 10-member Central team led by Union Joint Secretary, Agriculture, K Srinivas is scheduled to undertake a visit to Odisha’s drought affected areas from Thursday, officials said today. The team, which will reach the state capital tomorrow, will visit the drought hit areas in separate groups on December 3 and 4, Special Relief Commissioner (SRC) P K Mohapatra said. Mahapatra said the Centre has constituted an inter- ministerial team led by Srinivas after the state government submitted an interim memorandum on drought. The team will fly to the affected districts of Nuapada, Kalahandi, Balangir and Bargarh in two groups in a helicopter. After visiting the four districts, the team might take a decision to visit other drought affected districts, the SRC said. The team will leave for New Delhi on December 6. After being cornered by opposition parties over rising incidents of farmers’ suicide in the state, Odisha chief minister and Biju Janata Dal (BJD) supremo Naveen Patnaik today announced a whopping Rs 35,000 crore package for development western Odisha, now reeling under acute drought situation. The money will be spent in next five years and nearly 80 per cent of it will go towards improvement of the agriculture sector. More than 100 farmers have allegedly committed suicide in the state in the wake of the drought. Patnaik’s announcement came at a farmers’ rally convened by the ruling BJD at Sohela in Bargarh district of western Odisha. He announced a slew of measures including one percent interest on agriculture loan and additional assistance of Rs 100 per quintal during procurement of paddy in the drought affected areas. The BJD party in its election manifesto had announced to lower the interest on agriculture loan. The package includes Rs 8,000 crore for building of dams in the western part of the state. Two medium irrigation projects will be built in the Bargarh district. One will come up on river Aung at a cost of Rs 1,500 crore while the other will be on river Jeera at a cost of Rs 300 crore. The state government will spend about Rs 13,000 crore for construction of separate feeder line for supply of power to the farmers and rural electrification. In a reprieve to the farmers, the state government has already decided to suspend collection of crop loan and extend the loan repayment period by three years. “My government has taken farmers’ issue seriously. I have asked party MPs (members of parliaments), MLAs (members of legislative assembly) and other leaders to meet farmers and extend their help,” said the Chief Minister. He took a dig at the Centre stating that the Union government has not released a single penny as drought assistance till date while the state government has sanctioned Rs 1,000 crore for drought relief. “Odisha faces natural calamities at every two years interval. Natural calamities like Phailin, Hudhud, drought and unseasonal rains have hit the state in last five years. The economy of the state has been hit, but the Centre has ignored the demand for special category status,” said Patnaik. The opposition is trying to weaken the farmers’ confidence. They must stop politicising the plight of farmers, he added. In retaliation, state unit of Bharatiya Jana Party staged a 12 hour hunger strike at Bhubaneswar. “It is not a farmers’ rally in western Odisha, it is the convention of the party workers. The convention is against the cause of the farmers”, said Pratap Sadangi, senior BJP leader. Suicides reports of fourteen farmers from Western Odisha within a fortnight have gripped the whole region in shock and grief. Politician donot bothered about it because it is not an election time. Neither had we heard any sympathetic words from the agriculture minister in any media. The culture, economy and society of Western Odisha have evolved by build-up with a cohesive bonding affiliating to agriculture since time immemorial. Western Odisha is based on an agrarian economy. If harvesting of crop is good, farming community thinks about marriages in the family. If crop harvesting is not as per expectation, they postponed marriages. All the major festivals like Nuankhai and Phuspuni are agrarian. While Nuankhai is the festival of first crop cutting and offering it to the God/Godess, Phuspuni is the harvesting festival. Today, Nuankhai is celebrated even in foreign countries and major metros of India by the non-residents. But the man behind the Nuankhai and Phuspuni festival, the farmers, is living in an unspeakable pathos and insurmountable grief. The state government has all kind of schemes for all categories of people but none are in use; all government schemes are as if meant for the thekadar and chamcha of the ruling political party. The Government collects huge revenue from this region, almost 75 per cent. But never works for the tax payer. The farming community who filled the state treasury is abandoned like anything. Farmers are deprived of their basic rights. They are neglected. If a state is not meant for its subjects then the subjects have to introspect about the state. Time has arrived. Author Comments on Politics and Culture. The opinions expressed in this article are the author’s own.